On Saturday April 25th Chris Neidl of Solar One gave a presentation at ecoartspace NYC on solar energy. His talk focused on NYC and why the outer boroughs (in particular Queens and L.I.C.) pose a good prospect for solar panels (PV), providing many flat rooftops that are not shaded by tall buildings. His comprehensive lecture explained the current energy situation in NY in terms of the history of power plants, the energy grid structure, why NYC is susceptible to power failures and why solar energy could mitigate many of the existing problems. Energy use skyrockets in NYC during peak summer usage (prolonged hours of A/C use) which is not coincidentally the same time period that solar panels would kick in to provide the most benefit. Chris also discussed current energy legislation in NY State, how we as individuals can influence policy decisions (get active), cost benefit analysis/financial incentives for PV use and comparisons to other countries (Germany, Japan, Spain, Italy in that order) and U.S. states most using solar power (CA, AZ, NJ, NY). Not surprisingly in states where conventional power is cheapest - the incentive for using solar power is low, but NY State has the highest electricity costs in the country by a long shot. 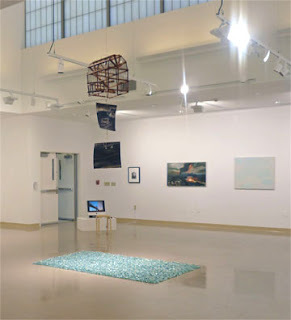 On April 16th, along with co-curator and artist Joy Episalla, I gave a gallery tour of the "out of the blue" exhibition at Bergen College to a large group of art department students. The exhibition's focus was on weather, atmosphere and geological conditions, both literally and metaphorically. We discussed the idea of how artists create their own weather conditions and even "storms" in terms of their influence upon one another individually and as a group such as in this exhibition. While walking around the gallery during the tour, I pointed out some uncanny relationships between the art works that were mostly unintentional. I mentioned that without seeing their works at the same time in this show, I would not have realized before the possible influence of Robert Smithson on Felix Gonzales Torres for example, but Smithson's photograph of "Glue Pour" 1970 and Gonzales-Torres bright blue candy wrappers on the floor, Untitled, (Revenge) 1991, begged comparison in terms of ideas related to fluidity, entropy and erosion over time. On April 6th, I was on a panel at the University of Albany Art Museum in conjunction with Jason Middlebrook's exhibition and installation , Live with Less which explores the relationship between nature and human consumption. Middlebrook who make paintings, drawings, sculpture, and outdoor public works often uses recyclable materials to draw attention to larger social issues. Live with Less is an expression of Middlebrook’s artistic and environmental goal to see beyond the discarded nature of these materials and to re-imagine them as something beautiful and useful. He literally brings wastefulness and the over consumption of contemporary living to new heights in a massive 35-foot tower made from several tons of recycled cardboard. The cardboard, collected on campus over a two-month period, was stacked and layered from floor to ceiling creating visual stratifications analogous to the layers of a landfill. The panel discussion titled, Responsive Art: Making Work in the Environment was moderated by Rebecca Wolff, editor at Fence Books and also included Jason Middlebrook and critic/poet Francis Richard who writes for Cabinet and Artforum. Richard also organized an exhibition and accompanying monograph titled Odd Lots: Revisiting Gordon Matta- Clark’s “Fake Estates.” I spoke about the fact that as a former sculpture park director and curator I’ve worked with many artists on site specific works outdoors, but one thing that is often not addressed by artists and art institutions is maintenance and long term care. As mundane as this might sound it’s really a very important component of making site specific work that isn't taken into consideration. What happens to the work 2 weeks or 6 months or 6 years later? What are the effects on the art of weather over time and has that been considered? Since Francis Richard is a scholar on the work of Gordon Matta Clark we spoke quite a bit about his work and how today it would be difficult if not impossible to do his urban based interventions in abandoned buildings in U.S cities. We also spoke at great length about Robert Smithson. I stated that generally speaking Land and Earthworks artists in the 1970’s were not what we today call “site-sensitive” - meaning they worked in remote and vast stretches of open space with land-moving equipment, bulldozers, etc... with little or no regard to the natural environment. Contemporary artists working outdoors today are usually more respectful of the natural world and take into account the attention and sensitivity that is needed when making an artwork on the land. Lastly – I mentioned that not all artists are well suited to working outdoors, site-specifically (and don’t have to be) - but working with Jason Middlebrook last summer at Art Omi was one of my better experiences. Unlike many artists who came for the day, having created their works off site in the studio and then placed them in the woods - Jason spent time looking, and searched out the right site which nature graciously provided him with. He found a fallen tree suspended in the pond. Jason worked on site for 2 weeks, planed the tree in half, created a painted bench complete with binoculars for viewing aquatic life and a stairway out of the wood for easy access to reach the pond. On Weds April 29th, I attended a lecture by Neal R. Peirce hosted by The Trust for Public Land. Peirce spoke eloquently about his new book, Century of the City, sponsored by the Rockefeller Foundation. By 2050, the United Nations projects, almost three-quarters of the world's population will call urban areas home. To help manage and plan for this accelerating urbanization, the Rockefeller Foundation convened an exceptional group of urbanists--leading policy makers and government officials, finance experts, and urban researchers for a Global Urban Summit at the Rockefeller Foundation Bellagio Center. This book shares their diverse perspectives, creative approaches, and urgent agenda for harnessing the vast opportunities of urbanization for a better world.